Yesterday I shared with you a beautiful photo of my son and his new wife at their wedding ceremoney on Long Island. 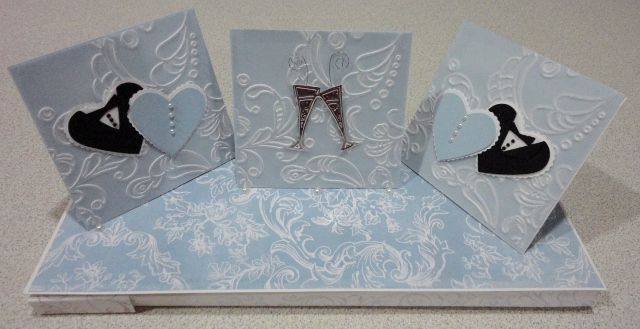 Today I am going to share with you the Wedding Card that I made for them. I did not know wht the colour scheme was to be other than the men were wearing blue shirts, so that is the colour I used for the card. The base of the card I used White Shimmer cardstock, and the embossed mats were done in Bashful Blue. I absolutely adore the Presto DSP and I brayered that with Bashful Blue to give the look that I was after with it. I embossed vellum cardstock with the Finial Press embossing folder and layered this over the Bashful Blue Cardstock.The hearts were punched out using the large heart punch and my good friend Kris lent me her heart emboslit to give the hearts a final touch. I placed some basic pearls to hold the easels where they sat naturally on the card base. The champage glasses on the centre easel are not SU. I was asked by so many people how to make the card and I have had the tutorial for the single, double and the triple twisted easels placed on SUDSOL. This lovely card needed a special envelope in which to hold it so I carried the theme though by making one of my 'Envo Box's to hold the card. I used Whisper White cardstock for the body of the box and then used the Baroque wheel and rolled the decorative edge. A strip of the Presto DSP was placed on the box and to that I attached two hearts which co-ordinated with the card that was inside. Notice the small pearls the easel is resting against. this is the most beautiful card I have ever seen how needs a present when the card is that nice. 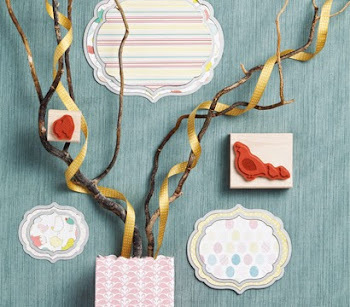 I am going to try this easel card for sure. very creative!